U.S. Rep. Mazie Hirono raised more than $624,000 during the past three months for her Democratic primary for U.S. Senate, her campaign announced today. Star-Advertiser. Former U.S. Rep. Ed Case said Wednesday that he would bridge a "yawning chasm" between business and government, describing government as too intrusive and an obstacle to economic growth. Star-Advertiser. Former Gov. Linda Lingle said Tuesday that she would work with members of both parties if elected to the U.S. Senate, but also said Hawaii would benefit from having a Republican in its congressional delegation. Maui News. Maps for new House and Senate districts are not likely to be ready by Feb. 1, the day when candidates can begin filing for elective offices. Star-Advertiser. Hawaii teachers will see 5 percent pay cuts lifted after two years in exchange for annual evaluations and performance-based pay, if they ratify their tentative agreement with the state. Civil Beat. Public school teachers would continue to take a 5 percent pay cut under a proposed contract but would move to a new salary schedule and evaluation system in July 2013 and would be eligible for annual pay raises based on their performance. Star-Advertiser. Facebook and Twitter could become the virtual town square for spirited public debate if the state’s public information watchdog agency has its way. The Office of Public Information Practices has submitted two legislative proposals to Gov. Neil Abercrombie to be included in his administration’s package for the coming session, which begins next week. Civil Beat. Rewards of up to $30,000, the largest of their kind in Hawaii, are being offered for confidential tips that lead to the arrest and conviction of whoever killed three critically endangered Hawaiian monk seals on Molokai and Kauai since November. Star-Advertiser. The number of foreclosures in Hawaii dropped by half last year as lenders grappled with a state law that changed the way they could file nonjudicial foreclosures, according to new data from RealtyTrac. Pacific Business News. Local Oil Expert Questions Hawaii’s Renewable Energy Market. KITV4. Hawaii's papaya industry is now exporting the genetically engineered Rainbow papaya to Japan after the Japanese government approved commercial shipment of the fruit on Dec. 1. Tribune-Herald. Hawai’i small business owners participated in their 36th annual conference today on O’ahu. Hawaii Public Radio. State roundup for January 12. Associated Press. A looming three-way race for Honolulu mayor poses a dilemma for voters, who could be forced to choose between allegiance to political party or their position on the biggest public works project in the city's history. Star-Advertiser. A historic downtown building with a storied past may have a new chapter ahead in the arts, and it could have State departments on the move. KHON2. A former Hawaii Pacific University administrative assistant was sentenced to five years probation for stealing more than $13,000 in school parking fees. Hawaii News Now. Hawaii County has fired four elections workers, including the program administrator, following an investigation into alcohol storage and private business activities allegedly conducted at a Hilo elections warehouse. Tribune-Herald. China and India are catapulting to the forefront of astronomy research with their decision to join as partners with the Thirty Meter Telescope, which will be the world's largest when it's built later this decade. Associated Press. The Hawaii Board of Education has agreed to hear an appeal by organizers of the Laupahoehoe charter school, who claim that their charter has effectively been revoked by the school's oversight body. Tribune-Herald. The Kealakehe Elementary School library will soon get air conditioning, and other Big Island schools will see other maintenance projects begin, after Gov. 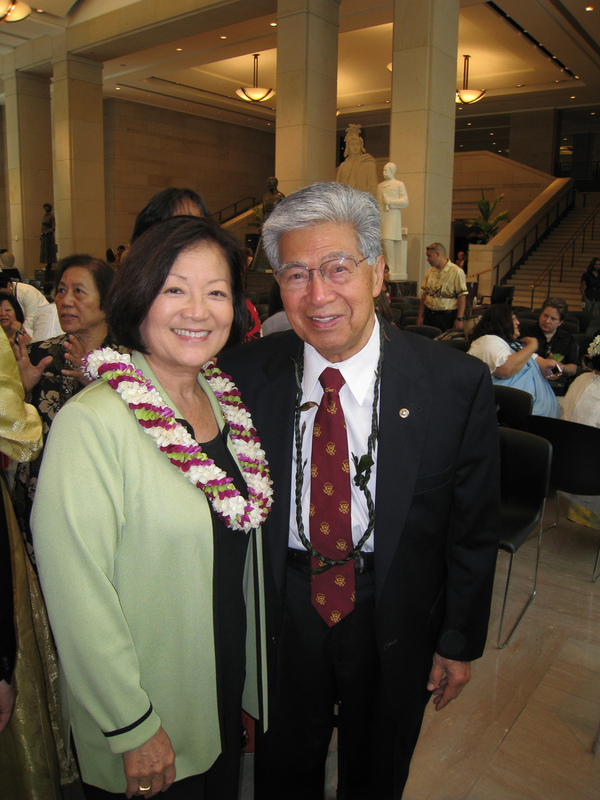 Neil Abercrombie released $14.2 million for capital improvement projects. West Hawaii Today. Former Hawaii governor Linda Lingle (R) began the first official day of her campaign for a seat in the US Senate by visiting some local businesses in the Haiku Cannery on January 10, 2012. Maui Now. The Maui Planning Commission decided Tuesday that former interior designer Xorin Balbes can follow his dream after putting everything he has into renovating Makawao's Fred Baldwin Memorial Home to turn it into the Lumeria Maui educational retreat. Maui News. Two nonprofit organizations and an anonymous donor have teamed up to offer a reward of up to $30,000 for information leading to the arrest and conviction of those responsible for the suspected slayings of at least three Hawaiian monk seals in the past two months. Garden Island. Kaua‘i County officials are urging the public to remove green waste from plastic bags when delivering them to green waste drop sites at a county transfer station or the Kekaha Landfill. Garden Island.